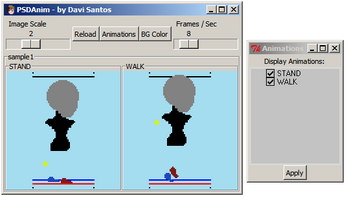 PSDAnim is a tool to auxiliate the creation of animated sprites and tiled images in Photoshop! You can edit in Photoshop (or any tool that exports PSD files) and view the results instantly (after save the file)! I created it to suit my own needs and speed up my workflow. Also it can be used with GIMP, Clip Studio Paint and Paint Tool SAI! For questions and more information contact me via Web, Twitter or Facebook. Download and run the auto-installer. A group PSDAnim is created in Start Menu and an icon in your desktop. Create a layer group for each animation frame with the syntax frameName_id. the underline character is required! frameName will be name of the animation. The id is not important. The animation is played using only the layer order. bottom to up!! Now every time you save the psd file in photoshop, the window is updated. v0.3.4 Update: Now display non inline animations. Just add "_offsetInPixels" after the id in the group name (for example: walk_1_12, the frame will be displaced by 12 pixels to left, walk_2_24 by 24 and so on). In PSDAnim window, select the menu Options -> Export frames. A folder in the psd's folder is created with each frame. Within PSDAnim installation directory, photoshop actions and JSX scripts are provided to help in some tasks. Put the jsx files in "..\Adobe Photoshop CSx\Presets\Scripts"
This will make the current animation frame visible and will hide all others except the next and previous animation frames. The visibility of the internal layers of each frame (and the background layer, if exists) is unchanged. Also the previous and next layers have the opacity lowered to 33%. The same of OnionSkinSelected, but with next of next and previous of previous animation frame. 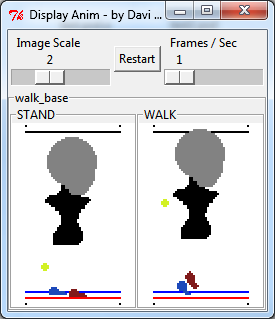 Hide all other animation frames (again the visibility of the internal layers of each frame is unchanged). And sets the current frame visible with opacity 100%. Create a new layer group with one blank layer inside. The name of the group is asked, and shows the default value of "frame_id" to reminder the underline character.